Bow hunting warthog South Africa with Mkulu African Hunting Safaris. 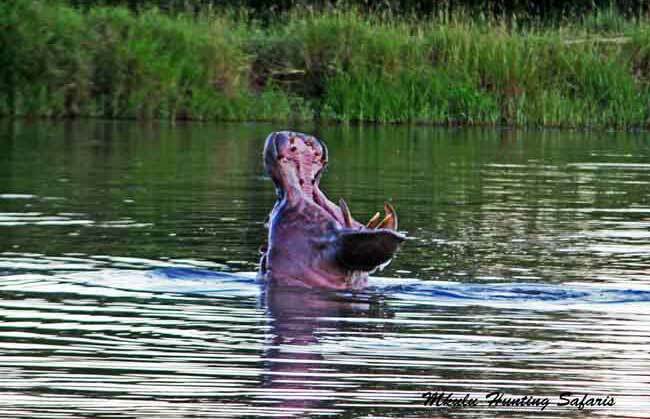 Bow hunting warthogs is one of the most entertaining forms of bow hunting. Stalking an old boar to within shooting range with a slight breeze in your favor becomes difficult when you draw. This is because a hunter can get so close to the animal that it will be able to hear the bow being drawn. Warthogs are tough animals that disappear in to their aardvark created burrows in the blink of an eye. The general idea is to make sure of the shot before the arrow is released. Mechanical broad heads can be used for bow hunting warthogs. During the rut (end April to May) the boar will accompany the sow and her depended offspring. Waterholes are favorite visiting spots during the heat of the day. Mudholes allow for a fair bit of wallowing and knee high logs are ideal for scratching all the places hard to reach. Boars are differentiated from sows as having a more masculine and broader face / head, and boars sport an extra set of warts above the tusks on the side of the facial region. Wounded warthogs have charged hunters before. At least one rifle must accompany the hunter during the follow-up. 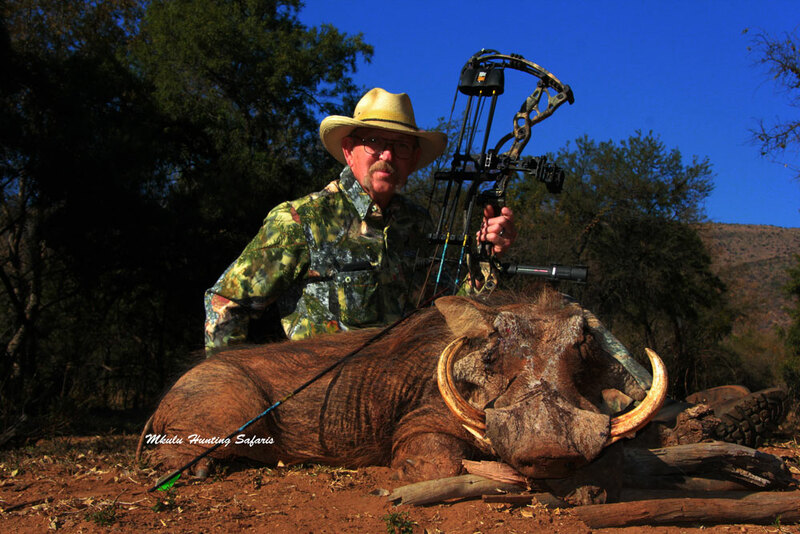 The warthog bow hunting prices South Africa have been confirmed at $ 350 for the 2018 African bow hunting season. The recommended draw weight for bow hunting warthog in South Africa is any increment greater than minimum draw mass. Any draw weight equal to or greater than 70 lb is recommended for bow hunting warthog. The minimum kinetic energy (KE) required for bow hunting warthog is 60 ft / lb. 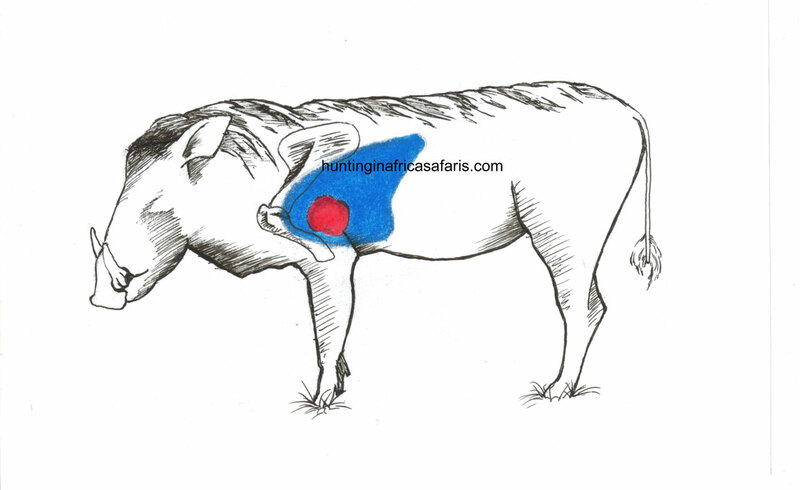 A minimum arrow velocity of 245 fps is suggested for bow hunting warthog in South Africa. A minimum arrow weight of 450 grains (gr) is suggested for bow hunting big warthog in Africa. Average shooting distance when bow hunting warthog in South Africa from our bow hunting blinds are seldom further away than 19 to 25 yards from your trophy warthog. You decide which brand broad head you would like to use when bow hunting warthog. Warthog have a rather small area covering the vital organs for adequate shot placement. Place the shot right behind the shoulder of the warthog in line with the front leg, one third of the way up from the bottom of the chest to the top of the back. This shot should result in a high heart / lung shot leading to the warthog expiring in the least amount of time. Quartering to shots are not recommended due to the position of the head and the heavy brisket area. The following tips for bow hunting warthog are done from the perspective of still hunting from a blind. Warthog usually come in to water during the mid-mornings anywhere from about 9 am – 1 pm and then for a second round from about 3 pm onwards till dusk at about 5:30 pm during our winter months. Warthog come to water cautiously and will make short dashes away from the water before finally going to the drink. Warthog will often stand some distance away from the water and approach a few steps at a time with younger animals running in and immediately start drinking. Once the heads are down they are still alert and may even dash of at the slightest thought of a sound or danger. Due to the availability and cost-effectiveness of these animals they are one of the 10 most popular animals to bow hunt in South Africa. The best time of year for bow hunting warthogs is during the rut. The warthog rut starts roughly after the fourth week of April (can differ slightly according to different regions and from year-to-year) and lasts until about June. Warthog families stick together when the boars join the sows and their dependent offspring for the duration of the rut. The big boars are usually in the back of an approaching family and are always in the front when running away from possible danger. We can and do bow hunt warthog from January to December.